IP Telecom partners with some of Ireland's most dependable and innovative technology providers to reach even more businesses with custom-tailored VoIP Solutions. Nostra works to design the most cost effective and dynamic ICT strategy for your business. Together, we develop the solution with the best technology, implement IT, support IT, and maintain IT with our complete range of trusted and proven skills in data infrastructure, managed IT services, cloud, contract resourcing, networking and security. Paradyn is the amalgamation of three of Ireland’s leading telecom, managed service and network infrastructure companies. Irish Telecom, Netforce and Exigent Networks have united under one brand to deliver Ireland’s first and only fully managed IT service company. Definitive Solutions is an IT support and managed service company specialising in outsourced IT for organisations throughout Ireland. They provide complete solutions from network virtualisation and cloud computing to desktops, printers and phone communications equipment. Formed in 2004, IT.ie are a leading Managed IT Support company based in Finglas, Dublin. Their ‘IT-as-a-Utility’ offering is a unique IT Support package that is customer-centric & individually tailored for each and every business. They enable you to treat your IT like any other utility bill. In simple, easy to understand & affordable monthly payments. IT.ie – Supporting Nationwide. Acting Local. NSSL has been providing specialist computer network solutions in Ireland since 1990 - specialising in the design and installation of unified voice and data IT network solutions to suit business needs. Their strategic business partnership agreements and accreditations ensure that the latest in technology and expertise is always available to their customers. Phonelink supply, install and maintain a wide range of telephone systems. They are recognised accredited dealers for several manufacturers and provide a range of options on systems based upon specified requirements. They constantly keep up to date on all aspects of the rapidly developing telecommunications industry and respond to it as new products and services are brought to the marketplace. Unitec are an international technology company with offices in both Ireland and South Africa. Established in 2009, Unitec were quickly acknowledged as one of Ireland’s most innovative managed IT providers operating out of Clonmel, Cork, Dublin and Waterford City. supportIT provide fully managed support and consultancy services. Dedication, knowledge and trust are the main reasons why businesses choose supportIT as their IT solutions and support partner. They are a relationship driven organisation and work closely with every one of their clients to support and protect their infrastructure while providing solutions that are aligned with business and IT requirements. Radius Technologies is a people-centric organisation that delivers IT, Telecoms and private Cloud solutions to progressive SME’s in Ireland. Radius holds ISO 9001 Quality, ISO 27001 Information Security and Microsoft Gold accreditations. With over 22 years’ experience, our highly accredited team provide a trusted nationwide service, leading to long-lasting, value-driven relationships. Their aim is to be our customer’s outsourced strategic Technology partner, enabling them to drive profitability and value in their business. Unified Technology Solutions Ltd was established to combine their Telecoms business and Security Solutions. Their Product Portfolio has now expanded into many areas, including a Complete Range of Telecommunications & IP Solutions, CCTV & Security Division, and more. They are continually updating their knowledge in both the Telecoms & Security Sector and can provide a catered installation & service to suit a customer’s requirements. 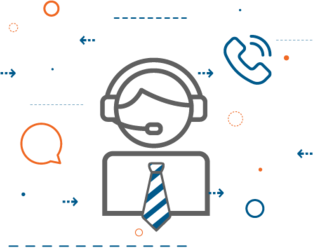 GoldStar partner with their customers to be available when they’re needed, to ensure that any Telecoms or IT related query that’s affecting their business, GoldStar will be on the end of a phone, and will help in any way they can. They partner with best in class Suppliers, from market leading powerhouses of Telecoms in Ericsson LG, to the dynamic team at IP Telecom, so that they can deliver feature-rich Business Telephone Solutions. Dotnet.ie operates in four specific areas – Business Automation Consultancy; Software Development; Managed Services and Cloud Migration inc. VoIP applications. Dotnet.ie's primary focus is ERP solutions using Intact iQ and Intact xLine. With that in mind Dotnet.ie have developed the only solution integrating IP Telecom's Hosted PBX with Intact allowing the end user to seamlessly make, receive and record phone calls within the Intact platform. Vu2Vu™ is a global group of companies with offices in Ireland, India, UAE, and USA with an expanding network of regional sales partners.